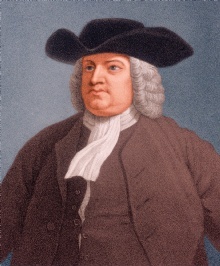 William Penn was a famous Leader from England, who lived between October 14, 1644 and July 30, 1718. He became 73 years old. William Penn (born in London, died in Ruscombe, Berkshire) was an English Quaker. He is born under the zodiac libra, who is known for Balance, Justice, Truth, Beauty, Perfection. Our collection contains 43 quotes who is written / told by William, under the main topics: Words of Wisdom, Death, Health. "Less judgment than wit is more sail than ballast"
"It would be far better to be of no church than to be bitter of any"
"Sense shines with a double luster when it is set in humility. An able yet humble man is a jewel worth a kingdom"
"In marriage do thou be wise: prefer the person before money, virtue before beauty, the mind before the body; then thou hast a wife, a friend, a companion, a second self"
"If thou wouldn't conquer thy weakness thou must not gratify it"
"Force may make hypocrites, but it can never make converts"
"Avoid popularity; it has many snares, and no real benefit"
"A good End cannot sanctify evil Means; nor must we ever do Evil, that Good may come of it"
"Love grows. Lust wastes by Enjoyment, and the Reason is, that one springs from an Union of Souls, and the other from an Union of Sense"
"O Lord, help me not to despise or oppose what I do not understand"
"Nothing does reason more right, than the coolness of those that offer it: For Truth often suffers more by the heat of its defenders, than from the arguments of its opposers"
"For death is no more than a turning of us over from time to eternity"
"A true friend freely, advises justly, assists readily, adventures boldly, takes all patiently, defends courageously, and continues a friend unchangeably"
"Truth often suffers more by the heat of its defenders than the arguments of its opposers"
"Much reading is an oppression of the mind, and extinguishes the natural candle, which is the reason of so many senseless scholars in the world"
"Right is right, even if everyone is against it, and wrong is wrong, even if everyone is for it"
"Men are generally more careful of the breed of their horses and dogs than of their children"
"Kings in this world should imitate God, their mercy should be above their works"
"We are apt to love praise, but not deserve it. But if we would deserve it, we must love virtue more than that"
"True godliness does not turn men out of the world, but enables them to live better in it and excites their endeavors to mend it"
"To be like Christ is to be a Christian"
"Some are so very studious of learning what was done by the ancients that they know not how to live with the moderns"
"Patience and Diligence, like faith, remove mountains"
"Men must be governed by God or they will be ruled by tyrants"
"He that lives to live forever, never fears dying"
"He that does good for good's sake seeks neither paradise nor reward, but he is sure of both in the end"
"Between a man and his wife nothing ought to rule but love. Authority is for children and servants, yet not without sweetness"
"The tallest Trees are most in the Power of the Winds, and Ambitious Men of the Blasts of Fortune"
"Passion is the mob of the man, that commits a riot upon his reason"
"Love is the hardest lesson in Christianity; but, for that reason, it should be most our care to learn it"
"To be a man's own fool is bad enough, but the vain man is everybody's"
"Let the people think they govern and they will be governed"
"Knowledge is the treasure of a wise man"
"Justice is the insurance which we have on our lives and property. Obedience is the premium which we pay for it"
"He who is taught to live upon little owes more to his father's wisdom than he who has a great deal left him does to his father's care"
"Force may subdue, but love gains, and he that forgives first wins the laurel"
"Passion is a sort of fever in the mind, which ever leaves us weaker than it found us"